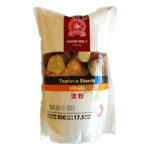 Tapioca is made from the Cassava root and Corn Starch is made from Corn. Both are gluton free which is great for people who suffer from wheat allergies. We recommend tapioca to corn starch or flour because, in the event you use just a little more than you should, the texture tends to remain more creamy.